However Noah looked from the previews, I went into the theater determined to give the film a fair chance. The opening scenes took me aback as rather amateurish. When I left the theater, my feelings toward the film were ambivalent. When my friends and I ended up in a forty-minute conversation about its themes and message, I realized that the film operated on two levels, distinct yet so cluttered together that they are jarring as they play out on the screen. One level is that of a pseudo-Biblical “epic” offering us objects of contemplation as diverse and contrived as magic seeds from Eden that grow forests overnight and six-armed rock-Ents taking on armies. It is this level only that some will see and leave disappointed. The other, lower level is the true human epic, where questions of justice, mercy, righteousness, and free will converge on the broken, confused, devout figure of Noah. I have now seen four of Aronofsky’s films. The disturbing and erratic Pi, the gut-wrenching Requiem for a Dream, and the delicate spires of The Fountain each testify to the fundamental eccentricity of Aronofsky’s direction, the heady blend of brilliance and borderline silliness that leaves the viewer a slightly different person when the credits roll. Noah, despite its potential appeal to a mainstream audience, fits readily within that canon. It is frustrating and beautiful. Iceland is on gorgeous display; the CGI is acceptable. The acting is flawless, while the dialogue ranges from subtle and gripping to embarrassing and comical. The more “traditional” Hollywood elements (i.e., action scenes and Biblical mayhem) were probably pumped up by Paramount, which was no doubt desirous of nurturing a blockbuster, anxious to please both the action movie fan and the wary evangelical. This often gaudy surface level at times obscures the nuance and complexity of the lower level, but not always, and we the viewers are offered enough glimpses into the rich inner drama to come away feeling that the movie was messy and flawed and a little wacky, but also, somehow, profound. Darren Aronofsky was raised Jewish and now identifies as an atheist—his spirituality he describes as ecological rather than supernatural, encapsulated in The Fountain—but if he is nonreligious, he decidedly did not choose to adapt a major Judeo-Christian classic for the money. This is, like most of his films, a project of genuine passion. When he was thirteen he wrote a poem about Noah, and as an adult he dreamed of directing a film based on the Biblical story. He was fascinated by the questions the Flood story raised, most notably, Why would God choose a man, flawed by original sin, to perpetuate the very flawed race he was about to destroy? Why even have an apocalypse between Cain and Babel? Though no believer in the literal truth of the story, Aronofsky continued to be captivated by its poetry and mythological significance until at last he had the opportunity to realize his dream. Besides this attachment to the story itself, Aronofsky’s work is pervaded—one might say “haunted”—by his postmodern spiritual inheritance. The Fountain churned together bits of Christian romantic mythos, Eastern mysticism, and New Age-y science fiction under the golden light of basic human wonder, while Pi freely blended Jewish esotericism and number theory with elements of the traditional thriller film. Noah lacks a definite mysticism, but Noah’s tormented obsession with fulfilling God’s will serves as a channel for similar themes. Tom Creo, Max Cohen, and Noah are all engaged in a search for meaning beyond the mere expanse of a single human life. All end, not in answers, but in acceptance and recognition of the mystery of which human life partakes. Noah is not a man who, at the close of the story, rests happily in a revealed and definitive word from God; he is, like the Bible character, a frustrated drunkard, but a drunkard who is somehow “righteous,” dimly aware that he is called to participate in a cosmic reality beyond his powers of understanding. “Be fruitful and multiply,” he blesses his children at last, surrendering his fears for the future of the earth to its Creator. The heart of the film consists of this tension between the necessity of making choices and the inescapable presence of evil. How is Noah righteous? How is Noah at all like God? This seems to lie in his choice of submission and death. It is made clearer by the presence of the antagonist, Tubal-Cain. Whereas Noah seems a perpetually gloomy fatalist, Tubal-Cain is by contrast full of energy and charisma and confidence. Noah concludes the justice of God means the sacrifice of his life and that of his family, and he submits to it tearfully but resolutely. Tubal-Cain is desperate for self-preservation, anxious to make his own destiny and “take dominion” over the world. Yet it is Noah, the servant, who is preserved and given dominion. Tubal-Cain lays claim to the image of God to act as sovereign, giving and taking away life; Noah, in surrendering his own will to the transcendent necessity of justice and mercy, shows himself to be truly in the image of God. Tubal-Cain, king of the old world, dies as the ark lands on the new world, the world that is given to Noah’s descendents to populate. Faced with the failure of what he believes to be his mission, Noah chooses mercy nevertheless, and so fulfills his true mission. How is Noah righteous? He is fully self-giving, and in his desperation and confusion and most horrific choices, he is being led back toward the order that underlies creation, the order that requires both justice and mercy. When he finds it, the dove comes to him with tidings of a new earth, an earth he is now ready to steward. It is true that Noah departs from the letter of the Bible narrative in more than a few places. Most of these are additions—the Watchers from Jewish apocrypha, Methuselah as quirky guru mentor, Tubal-Cain as antagonist, Noah’s crisis over an unexpected pregnancy, etc. Ham and Japheth do not have wives to bring along in Aronofsky’s version. Corrupt humanity is not portrayed as reveling carelessly in sinful pleasures but as desperate, angry, and dying. But thematically and in the actual sequence of events, it is very Biblical. Its emphasis on the environment is hardly unwarranted by the text, especially given the strong ecological aspects of the Noahic covenant, in which God clearly associates stewardship of the earth with brotherhood. It maintains a tone that avoids the extremes both of pseudo-naturalism and “soft voice from heaven” kitsch. We should also remember what the story of the Flood is really about, for Christians. Regardless of the literal truth of its events, it is not inert history. As Aronofsky realized, it is not at its core about “the righteous” being favored over “the unrighteous,” though this theme is present (cf. 2 Peter 2); God recognizes that all men are by inclination evil, even in the same breath that he promises not to destroy all flesh again (Genesis 8:21). It is not just about the nearness of God’s judgment on sinners. For Christians, the story of Noah is about baptism. The other day I was halted by a line in 1 Clement 9: “Noah, being found faithful, by his ministry preached regeneration to the world.” Referring to Noah’s “ministry” would seem somewhat odd, given that its principal feature was to wipe out human civilization. Clement ties this ministry to the preservation of the animals, who were obedient in entering the ark. But the ministry of “preaching regeneration” involved the whole world—it involved the death of the world that its life might be new. 1 Peter 3 also connects the Noah story with baptism. St. Peter compares those who were saved in the ark with those who have been baptized in Christ. Baptism, a symbol of death, actually offers rebirth to the spirit. For those in Christ, the waters of death are also waters of life. Noah was saved through the water, and not he only, but the world was saved through death. Noah then became, like Christ, a new Adam, father of all living. Aronofsky’s Noah lends itself well to these themes. Aronofsky did not intend for Christ to be hidden in his movie, but his adaptation is at least faithful enough for us to find many of the same things there that we find in the Bible story. Noah is heroic but human, faithful but blind as we all are. The film looks unblinkingly at the tragedy of the story, of millions of men, women, and children being wiped out by the hand of God; it baldly and unapologetically admits the cost of re-creation, and that evil cannot simply be eliminated by human choices. These human choices bring us ever back to the edge of judgment, and make us ever in need of mercy. If, as Aronofsky suggests, humanity is so constituted, there is a deep-rooted need for the redemption offered in Christ. Ultimately, Noah offers us wide berth for interpretation. Some critics, Christian and secular alike, cannot take it seriously, labeling it “Aronofsky’s folly,” a fiasco with unsympathetic characters and pretensions to being an epic fantasy. Others recognize that some deeper purpose is at work. The Atlantic noted the “fierce moral intensity of Aronofsky’s vision” and read it as an extended dialogue between the two extremes of Tubal-Cain and Noah, a plea for reconciliation between competing codes of will and fate. Catholic World Report highlighted the fact that Noah finds himself in the apparent dilemma of a just and loving God. One of my friends found the treatment of God’s sovereignty and human choice powerful. Aronofsky himself remarked in interviews that its most important theme was how we understand righteousness; Noah finds it in choosing a balance between justice and mercy, not in the elimination of humanity’s imperfections, which continue to haunt him and his descendents after the old world is gone. 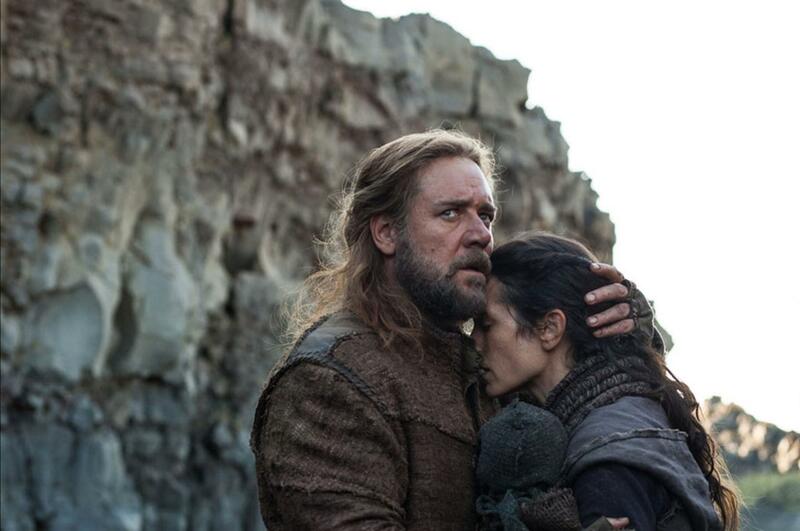 In Noah, Aronofsky has failed to deliver full justice to the potential of his vision—but there is a genuine gleam of insight into grace beneath the encrustation of pretense and noise. This is not, fortunately, a Sunday school lesson with a big budget. Some viewers will find Noah and his choices repulsive, God a brutal mass-murderer, the understanding of humanity bleak and tortured. But Aronofsky has treated his ambiguous characters with mercy, a mercy he affirms as divine. Go see it, be confused, and talk about it afterward. Even if you cannot get over the less artful moments, Noah offers a surprisingly nuanced and generous reflection on timeless questions that may inspire thought and conversation long after you leave the theater. This entry was posted in Film Reviews, Theology and tagged baptism, Clementine epistles, Darren Aronofsky, ecology, environmentalism, human nature, justice, mercy, Movies, Noah, original sin.